But it is understood the cash-strapped Gunners' top transfer target remains Roma star Cengiz Under. According to journalist Nicolo Schira, Arsenal scouts were in the stands on Saturday to see Suso in action at Chievo after watching him against Cagliari last month. The winger, 25, is enjoying a good season at the San Siro with six goals and seven assists for Gennaro Gattuso's side. But while there certainly appears to be interest in the former Liverpool flop – who managed just one League Cup goal during his time in England – Arsenal remain keen on Under. The pacey Roma winger, 21, had been in fine form this season but injury has kept him out of action since January. His six goals – three of which have come in the Champions League – and nine assists have grabbed the attention of some of Europe's biggest clubs. And it is no wonder the Gunners are keen to bring in another attacker this summer. Boss Unai Emery will want someone who can shine in either his three-man attack or as part of a trio behind a central striker. With Aaron Ramsey heading the other way to Italy, Mesut Ozil struggling to fit into the system and Alex Iwobi not quite hitting the heights many are expecting on a consistent basis, it is understandable that Arsenal want to dip into the transfer market. 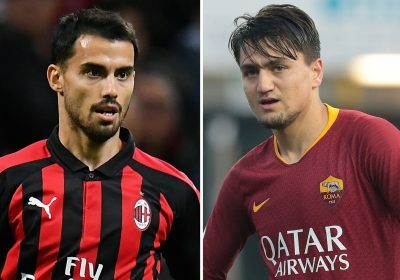 But although the Gunners may have their eyes on the likes of Suso and Under, it is unclear if they will be able to afford such signings this summer. Reports suggest Emery will have just £40million to spend, with a defender and a Petr Cech replacement already on his shopping list. And the potential lack of Champions League football again next season may make it incredibly difficult to lure some of their top targets to the Emirates.